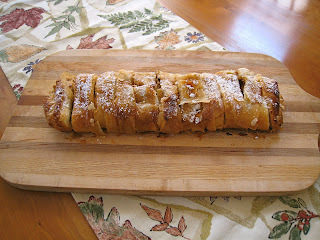 This weekend I made an apple strudel with fruit from the columnar apple tree. The recipe, from Cook's Illustrated, included peeled, sliced apples, raisins simmered in Calvados, toasted pecans, lemon juice, and a bit of sugar. You wrap the filling in five buttered sheets of filo dough, score the roll, and bake at 475 for 15 minutes. Cool, slice, then sprinkle with confectioner's sugar. Pretty easy. 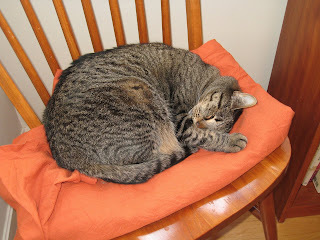 I got a new tablecloth for fall at the local consignment shop, Imagine That. Unfortunately, Zoe found it before I put it away, so now it needs to be washed. I've been swamped with work, including one particularly complicated website catalog that goes on, and on, and on. My mom is preparing to depart for her winter in Florida (Thursday) and that'll be about the time that the painters arrive to do the living room, dining room, and hallways in exciting new colors. (Well, not exactly exciting, but certainly less neutral neutrals.) Preparing for that will involve moving all the window treatments, pictures, and breakables to the basement, including all the china from the china cabinet. Unfortunately, the previous owners used high-gloss on the window trim, baseboards, and five doors. That will have to be sanded in order for the new semi-gloss to adhere properly, which drove the bids up a bit. After the professionals do the more visible rooms, I'll be tackling the yoga room and bathroom painting myself. Wow! Congrats on the re-vamping of the house! So many changes going on with everyone. Tis the season, I guess. I'll have to pop by, once it's finished and, hopefully, before I leave Ballard. Sniff.